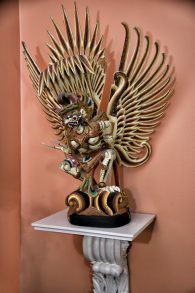 Living in the spotlight of the art world, Andy and Steve Steinman put their private collection on display. Andy Smith and sculptor Steven Steinman met at an Atlanta art show 30 years ago. He was an established artist with bachelor’s and master’s degrees from the Rhode Island School of Design, as well as a master of fine arts from the prestigious Pratt Institute and a doctorate from Capella University. She was also schooled in the arts, having earned a bachelor’s at the University of Arizona. 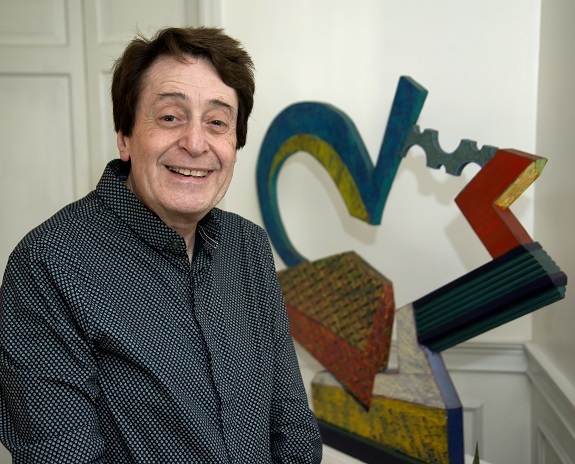 While Steve was teaching at American InterContinental University, where he would work for 33 years and become the dean of the design school, Andy worked at Atlanta Magazine and later taught art for Atlanta Public Schools. Both were deeply entrenched in the Atlanta art scene, a bond they share to this day. They have continued to pursue their artistic interests throughout their relationship. Steve creates art, while Andy shares her interest and knowledge of art with others. 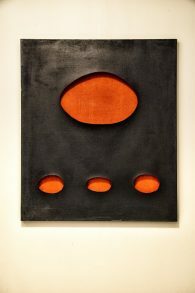 Steve Steinman’s studio work starts with him thinking outside the box and ends with a lot of sanding and grinding. 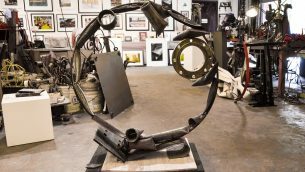 Steve can be found in his studio “making beauty from cast-off metal,” using recycled auto and junkyard parts to create large sculptures. He has carved out a reputation in Atlanta and beyond for his large outdoor compositions, including the sculpture lining the walls of the Buckhead MARTA station, which covers the length of two football fields, and Woodruff Park’s Monument to Slain Police Officers. As owner and operator of Art Adventures, Andy conducts monthly tours to Atlanta galleries and other locations where fine art can be found. Recent venues include the Abernathy Greenway Park, the Booth Western Art Museum and Hartsfield-Jackson Atlanta International Airport. Steve’s latest exhibition, “Trash: The Art of Recycle,” is on display at the city of Atlanta’s Gallery 72, 72 Marietta St., downtown, through Jan. 11. Tune in while Andy and Steve discuss their separate accomplishments and their private art collection, including why they were both drawn to their favorite pieces. Jaffe: Steve, can you tell us where has your art been shown? Steve: I’ve exhibited in galleries and museums worldwide, including the Museum of Contemporary Art, the Hunter Museum of American Art (Chattanooga), Elvehjem Museum (Madison, Wis.), the Brooklyn Museum, the American Center (New Delhi), Centro Cultural (Buenos Aries) and the Marietta/Cobb Museum of Art. Jaffe: On what are you currently working? Steve: My latest sculptures, which focus on reuse and renewal, are constructed from recycled metal materials. They investigate the importance of recycling by using individual shapes made from industrial machines, automotive parts and junkyard scraps. I create them in large, unified circles. They illuminate the transition from junk to beauty while examining society’s wastefulness. Steve Steinman’s creative base is his 4,000-square-foot studio on Zonolite Way. Jaffe: Do you work in other mediums? 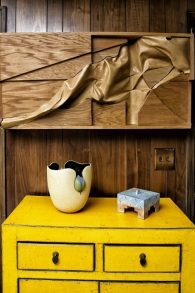 Steve: I’ve explored a variety of other mediums over my 50-year career, including use of concrete, wood, bronze and fiberglass. I also am a fine-art photographer, shooting images that are thought-provoking and lyrical. They reflect urban and rural landscapes, capturing people in public places as well as the unlikely physical landscapes created by art, architecture and natural beauty. 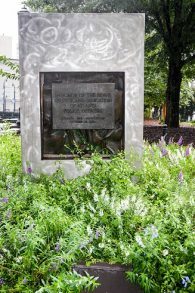 A Steinman monument in Woodruff Park is dedicated to the memory of slain police officers. Jaffe: How have you been active in the Atlanta art scene? 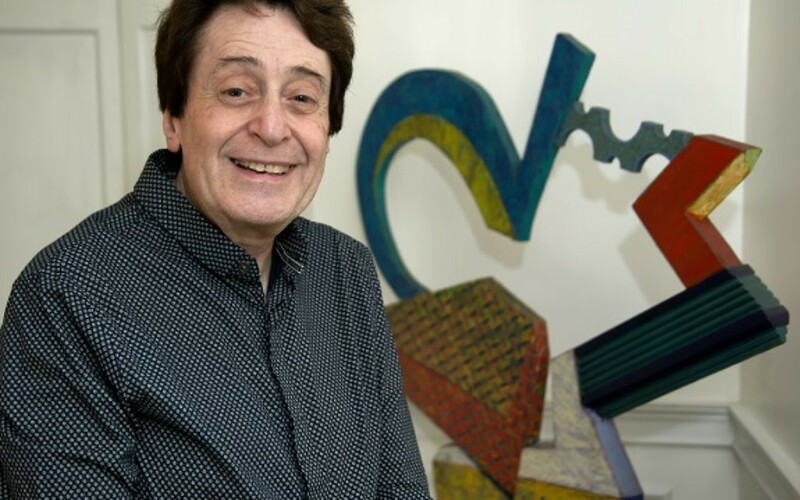 Steve: I was involved with Atlanta’s early art scene at Nexus Contemporary Art Center, serving on the Nexus board of directors and becoming a founding member of the arts advisory board for Studioplex on Auburn Avenue. Recently, I helped create the board of Cashin’s Sculpture Garden in Alpharetta, which exhibits a variety of regional Southern sculptors on a 150-acre farm. Jaffe: How do you create a sculpture? Steve: I begin each studio session thinking outside the box about what I want to say visually. The process begins on paper, then I weld the steel into abstract compositions. Once the shapes are made, I sand and grind the sculpture to get a smooth surface. Then I apply chemical patinas to unify and give it color. The final step is applying a sealer so the sculpture can go outside. Steve Steinman’s colorful sculpture design for the large Buckhead MARTA station took five years to complete. Jaffe: Describe your role in the Buckhead MARTA station. Steve: I was one of several artists asked to present ideas for the station. The architect chose my design, which took five years to complete. 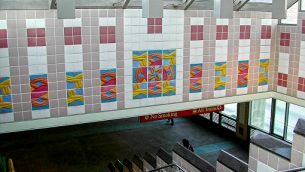 The Buckhead station is the city’s second-largest station and has the most art of any MARTA station. During the construction, I was on site to supervise. After it was built, I had a crew comprised of colleagues and students helping to paint the reliefs. The final sculpture elicits both a visual and emotional pilgrimage. Jaffe: Andy, how are you connected to the Atlanta art scene? Andy: My memories go back to the ’60s when I was on the staff of Atlanta Magazine. In the early days, everyone knew each other, and it was a small community. 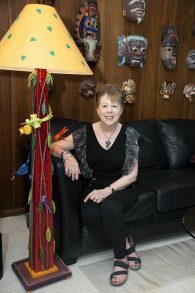 Today, I remain connected through my Art Adventures tour business, which has helped me maintain relationships with the local gallery owners. Jaffe: As a couple, which local artists do you collect? 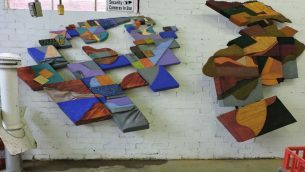 Steve: Some of our Atlanta artists include Herb Creecy, Ben Smith, Glen Eden, Mario Petrirena, Susan Loftin, Peg Morar, Vincencia Blount and William Mize. Our favorite piece was done by one of the most talented Southern contemporary painters, Vincencia Blount. We have two pieces by Howard Finster, a folk artist and Baptist minister who used divine visions as inspirations. Our Finster print depicts his iconic angels in a surreal landscape and was created at his famed Paradise Garden. We love our pottery pieces by Rose Cabat, who is in major museums around the world. Jaffe: What are some of the most unusual pieces you have? Andy: We have a figure drawing by Lloyd McNeill on the backside of a Julian Bond campaign poster. I saw Bond one day on the side of the road. He had run out of gas. I gave him a ride and told him about the drawing, which he begged me to give him, to no avail.